When you notice your drains are moving slow or not draining at all, you may have a clog or blockage within your drainage pipes. It may be your first instinct to run to the store to grab a DIY method of drain cleaning, but we advise against that because they often include harmful chemicals that will get into your clean water and not fully solve the problem. At Vietzke Trenchless, we are innovators in conducting professional sewer line video camera inspections in North Indian Trail. 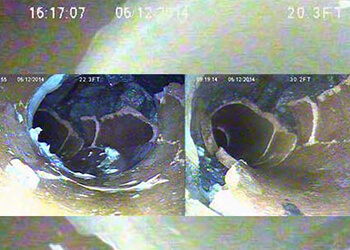 Sewer line video camera inspections are one of the most useful technologies plumbing and excavation companies can use to identify problems within your drainage system. The process involves a waterproof camera being inserted through a single-entry point to show our technicians a real-time visual of your underground pipes. The waterproof camera is connected to a flexible rod that makes it possible for the camera to weave its way through the most troublesome pipes. Why Are Sewer Line Inspections So Effective? Sewer line video camera inspections can be used in a variety of situations. Providing our team with real-time video, it makes it easy for our experts to identify the exact nature and location of the blockage or break. We can see if your drains are slow due to build-up or if roots from nearby trees are making themselves a home within your pipes. These inspections are also valuable because we can see if important objects have fallen into your drains such as jewelry. Through identifying pipe problems, we can then make sure that your North Indian Trail home or business is being served in the most effective way possible, leaving you with guaranteed results. The inspections we specialize in also allow us to determine the age of your pipes and potential problems that could arise in the future. This allows you to be proactive when it comes to your pipe health. If it weren’t for our specialization in trenchless technology like sewer line video camera inspections, home and business owners in the Spokane area would not be able to fix their drainage problems in a satisfying amount of time leaving them with the guesswork and property damage. Call Vietzke Trenchless To Perform An Inspection Of Your North Indian Trail Home Pipes Today! For residents in North Indian Trail, our team at Vietzke Trenchless would be happy to help you with your clogged or slow drains. Contact us today!